“You Might Get Hit by a Car”: On Secret Tape, FBI Threatens American Muslim Refusing to be Informant | Democracy Now! Muslim American who says the U.S. government retaliated against him and his family when he refused to become an FBI informant. He is speaking to us from Sudan. New details have emerged about the FBI’s efforts to turn Muslim Americans living abroad into government informants. An exposé in Mother Jones magazine chronicles the story of an American named named Naji Mansour who was living in Kenya. After he refused to become an informant, he saw his life, and his family’s life, turned upside down. He was detained, repeatedly interrogated and ultimately forced into exile in Sudan, unable to see his children for years. Mansour began recording his conversations with the FBI. During one call, an agent informs Mansour that he might get “hit by a car.” Mansour’s story is the focus of a new piece in Mother Jones titled “This American Refused to Become an FBI Informant. Then the Government Made His Family’s Life Hell.” We speak with Naji Mansour in Sudan and Nick Baumann, who investigated the story for Mother Jones. JUAN GONZÁLEZ: New details have emerged about the FBI’s efforts to turn Muslim Americans living abroad into government informants. An exposé in Mother Jones magazine chronicles the story of an American named Naji Mansour. After he refused to become an informant while he was living in Kenya, he saw his life and his family’s life turned upside down. He was detained, repeatedly interrogated and ultimately forced into exile in Sudan, unable to see his children for years. He ended up spending 37 days in a squalid prison in Sudan. After he was released from prison, FBI agents approached him again. This time Naji Mansour decided to record the phone conversation. During the call, the agent informs Mansour that he might get, quote, “hit by a car.” On Thursday, the phone recording was published by Mother Jones. Take a listen. FBI AGENT: If you did have any kind of business going on today or any kind of things like that, you’re going to find how miniscule and worthless it was compared to this fork in the road that you’re about to—that you’re about to take. NAJI MANSOUR: What are you talking about? No, why don’t you come out and say it? NAJI MANSOUR: Why don’t you come out and say? What fork in the road are you talking about? FBI AGENT: Dude, it’s—whatever. Honestly, I don’t care. I’m getting out of here. I don’t care. OK? And it’s—you know, when I tell somebody, “Hey, you know what? If you cross the street without looking, you’re going to get run over,” that’s not a threat, [bleep]; that’s advice [bleep], OK? You’re about to cross the street without looking both ways, and I’m telling you, “You know what? You might get hit by a car.” That is not a threat. That is a solid piece of the advice. So you don’t want to take it. We’re joined now by Naji Mansour via Democracy Now! from Sudan. And joining us from Washington, D.C., is journalist is Nick Baumann, who wrote the piece for Mother Jones magazine. Nick, let’s begin with you. Just lay out this whole story. NICK BAUMANN: As you heard, this is a story about Naji Mansour, who refused to become an informant for the FBI, and sort of what happened to him and his family, especially his family, after he made that fateful decision. And the way I start the story, and I think the best place to start, is with Naji’s mom, who’s a longtime U.S. government employee, and his sister, and they’re in Juba in South Sudan. And it’s the middle of the night, late at night. Juba is a very dangerous place. And they’re actually wandering the streets looking for Naji, because he’s been disappeared. They don’t know where he is. They’ve been told by his wife that—who was held with him and then released, that he’s being held in a blue building somewhere, but they don’t know where that is. And imagine just if this is your child or your brother, and you’re an American living abroad, just having no idea where that person is and having to search for them. And Naji believes—and I think with—he has a few good reasons to believe this—that the U.S. government sort of orchestrated the bad things that happened to him and his family. JUAN GONZÁLEZ: And, Naji Mansour, could you tell us how it is that you’ve later discovered that you came into the crosshairs of the FBI? Why did they begin to target you initially? And talk about those early—the early experiences you had. NAJI MANSOUR: Well, basically, in 2008, I was working in Dubai in an IT company. And due to the financial crisis, I had come back to Nairobi in late 2008. I had gone early 2009 to cancel my visa, and then I returned to Nairobi. I had, on numerous occasions, offered my place in Kenya, or my—actually, our family house in Kenya to a lot of travelers or anybody who would like to come by. And this is a family tradition that we have. We have traveled most of our lives, and we have been given accommodation, and we have given accommodation. So, apparently, just after I come back from Emirates, I get a call from a mosque acquaintance in Dubai, who, you know, I knew of, not so much, but we had several conversations. And on some occasion, maybe one or two occasions, I’ve offered him to come over to Kenya, or if he was ever in Kenya, that he should look me up, or something like this. He had called me, and he had asked for me to accommodate two young gentlemen coming by, his friends. I thought they would be coming from Emirates, but apparently they came from England. I kind of—I believed. When I was asking for more information, they had—the phone had cut. So, these two gentlemen happened to be on a watchlist. They had come over, stayed with me. And after about two weeks, my house was raided by local law enforcement. After the raid, which I—I wasn’t there, as can be read about in the story. After the raid, I secured some legal documentation barring my deportation, which is usually what they do to young men who are married to Kenyan women. Once I obtained this documentation, I handed myself in to the anti-terror police unit, and they had questioned me for two days and let me go. After that, I brought myself to the U.S. Embassy to report this to the consular section, to a person called Mike Fogarty. And he basically brought in another guy called Jeff Roberts, who was the deputy RSO, head of security over there, or deputy head of security. And he basically came in with—very quickly came in with two FBI agents. It was very—it was very candid, but I agreed to sit and talk with them. It was from that time that the FBI was involved in my case. AMY GOODMAN: I want to turn to another clip from the conversation between you, Naji Mansour, and an FBI agent. Here, the agent tells you they’re scrutinizing not only you, but your mother. NAJI MANSOUR: Exactly. My position hasn’t changed. NAJI MANSOUR: My position hasn’t changed. Scrutiny on my mother has nothing to do with anything, unless you’re making a threat. And currently, I told you the situation here, [bleep], that in this country, I’m kind of like—have you heard of the expression “beggars are not choosers”? I’m on contract. NAJI MANSOUR: I’m on contract. So I’m not giving you any illegitimate excuse. While you’re here, I’ve bent over backwards, and I really don’t—I really don’t like your tone. NAJI MANSOUR: I don’t like your tone, [bleep]. I don’t like your tone. NAJI MANSOUR: You have scrutiny on me, for what? What do you have on me? You have nothing on me. I’ve done nothing. AMY GOODMAN: Naji Mansour, speaking with the FBI. Naji, can you talk about what happened next? NAJI MANSOUR: Well, basically, if I can recall—I haven’t heard the tape in a while, but basically another FBI agent came on the phone. At that time, I was very angry because they had—they had basically started to pressure me to meet with them at a time that I was in a meeting. Just to put things into perspective, I have—at that time, was in Sudan for about a month. I’m basically starting my life over, trying to do random jobs, and they were pressuring me to meet at a time where I just couldn’t make it. And I hadn’t refused to meet with them, but I just refused to meet with them at that time. And I had told them that I could meet with them later, but they were really pushing for me to meet with them. And I kind of got insulted. I was already—you know, I was already apprehensive to the idea of meeting them, because of what I was told about them being involved in my—in my detention in Juba. So, afterwards, another agent, Amar—sorry, another agent came online, and he told me that, you know, I should come—he doesn’t buy into my lies, or something to that effect—and I should meet with him, and if I don’t, my life will change. And that’s when I told him, “Come out and say, what are you talking about, which fork in the road will I take?” And he basically—he wouldn’t go on into detail, but he said that there will be a series of events that will take place, and then he’s out of it. And sure enough, after that conversation, four days later, my mother, a government contractor working in Juba, was fired from her position, one day after she signed a new contract with her company. JUAN GONZÁLEZ: Well, Naji, you mentioned your detention in Juba. Could you talk about what was the pretext or the reason that you were detained and what happened to you during that period? NAJI MANSOUR: Shortly after the raid at my house in Kenya, about a month or so, I went to Uganda to visit my two older children. And on my way back into Kenya, they refused me entry. So I had went to Juba to stay with my mother, who was working there. And at the same time, it was in the plan to go there and to start a rugged laptop business that I had already previously been engaged in. Basically, I was there for about two months, living in Juba, going for meetings, and quite free. By that time, I kind of already had an idea why they wanted to question me. But, I mean, I would imagine that whatever happened in Kenya spilled over into Juba. I didn’t know how. I didn’t know why, why at this point. And we went in. And we weren’t really seriously questioned, but around the end of the day they basically threw us in a dark cell, separate—two separate dark cells. And they didn’t really—you know, they didn’t really tell us anything. They never accused me. They never charged me of anything. They wanted to know what had happened in Kenya. I told them. And then basically I just repeated the entire story to them very openly. 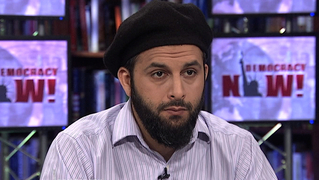 AMY GOODMAN: Do you know other people who have been pressured in the way you have, Naji? NAJI MANSOUR: I have come across other people who have been pressured. During my experience with an organization in Kenya called the Muslim Human Rights Forum, we came across several people who were pressured in different ways with regards to, you know, becoming informants. And they—them being under detention at the time was used as kind of a form of duress in which to get them to accept becoming an informant. JUAN GONZÁLEZ: Nick Baumann, could you talk about—put this in the context of FBI efforts around the globe to target Americans who are abroad, who they, in one reason or another, want to turn to provide them information because they may suspect they have ties to terrorist groups? NICK BAUMANN: Sure. So the FBI is very concerned about what it would call homegrown terrorism, or terrorism by American citizens. And it’s especially concerned about people going abroad to receive training or meet with terrorist groups, and stuff like that. And because of this, and because of its sort of huge need for informants—it has about 15,000 informants in the United States, basically one in every mosque in America—it’s always trying to recruit informants. And one of the ways it does this is it applies pressure on American citizens, usually Muslims, who are traveling abroad. One—you saw a recent lawsuit in which a number of American Muslims charge that the FBI and the government were using the no-fly list to pressure them to become informants. Basically they’re told they can’t return to the United States unless they cooperate with the FBI. AMY GOODMAN: I want to—I want to go to that. In that article, you write Fikre “was beaten on the soles of his feet, kicked and punched, [and] held in stress positions while interrogators demanded he 'cooperate. '” This is Yonas Fikre talking about how FBI agents had tried to make him an informant. YONAS FIKRE: They told me there was a case pending in Portland, Oregon, where I was living, and they needed my help. And I was kind of surprised. I said, “What case is there?” And they said, “Well, we can’t tell you. You have to accept—you have to be willing to help us, and then we can tell you. We don’t work like that.” They would give me money, that I would live a good life. They asked me, “Don’t you love your family? Don’t you want them to have a good life? You will make good money. You know, work with us.” And I made it clear to them. I told them I plan—I don’t plan to be an FBI informant or to be an undercover—whatever plan they were trying to do. But I told them that if there’s any question—if there’s anything that I know, you know, I would tell you guys. But as far as like me going in to anybody and trying to be secretly bringing any kind of information, that I would not do. AMY GOODMAN: That was Yonas Fikre talking about how FBI agents had tried to make him an informant. Nick Baumann, talk also about the significance of these clips that we have played of Naji Mansour and the FBI. NICK BAUMANN: So, I think the significance here is that a lot of these cases, you just sort of have to take the word of the people who are making these allegations. And in Naji’s case, it’s actually pretty well documented. You have this long interview that he recorded with the FBI agents in which they sort of confirm, or at least corroborate, some of his allegations. I obtained a document assessing—this intelligent document regarding his detention, sort of confirming that he had been detained when he said he was detained and for how long he was detained. I talked to, you know, Kenyan officials who confirmed his problems there. So there’s really a lot of corroboration for the story. And in terms of—I don’t want to—I don’t want to be naive. Of course, you know, it’s not totally uncommon for law enforcement to pressure or even threaten people that they want things from. But I think the thing you have to keep in mind about these recordings is that these FBI agents, they’re not—they’re not stupid, and they know that they’re in Sudan and they’re talking on the phone, and there’s a good chance that Sudanese intelligence is listening. And there’s also a chance that their conversation is being recorded. And so, this is—these are things that they were willing to say, knowing that they might have been recorded. So, what your listeners and viewers have to think about is: What would they have said if they didn’t think there was a chance that they were being recorded? JUAN GONZÁLEZ: And, Nick, the—I’m wondering if you’ve gotten responses from the FBI, not only about the effort to try to get to him to be an informant, but also to threaten and target family members if he refused. NICK BAUMANN: Yeah, so that’s the strangest part of this, right? That—let’s say you take the—you don’t believe Naji, and you take the worst-case scenario and you believe that he really knew that these guys who were staying in his house were bad guys, and, you know—and he’s a bad guy himself. Even if you believe all that, that doesn’t necessarily mean that his family is guilty at all. His mother is a longtime employee of the U.S. government, has worked for the U.S. Agency for International Development for years and years, had a security clearance, handled baggage for Laura Bush when Laura Bush visited Kenya. And, you know, his brother was a marine who served two tours in Afghanistan. His sister also worked for the government. And all these people have had trouble with the law since Naji refused to become an informant. And as you heard earlier, Naji’s mom lost her job. And the question is, you know: What justifies that? And the government, in general—the FBI, the State Department, the U.S. Agency for International Development—none of them are really willing to answer those sorts of questions. They were willing to sort of talk generally. And the State Department did confirm that they had—they confirmed Naji’s detention and confirmed that they had visited him in detention. But in terms of the firing of his mom, there’s not much information they were willing to give. AMY GOODMAN: Naji Mansour, if you could, in this last 30 seconds we have, explain why you’ve decided to come for the first time on national, international television? The significance of releasing these FBI calls, for you? NAJI MANSOUR: Basically, personally, I had wanted to come out with this since I was detained in Juba. And I had actually told the embassy to do so, to—they had a form, and I told them to alert everybody, including the media, including my state senator, everybody. Unfortunately, they did not do so. And afterwards, when—after I was released, my mother had some concerns, because of what would—you know, the blowback that would come to us if I did go to the media. But four years on, this is still happening. The government is still asking me out for coffee, last time I went to the embassy to renew my passport. Basically, this is not going away, and we need to make it stop. I want my life back. We want our lives back. This is Democracy Now! When we come back, The Yes Men strike again.